The U.S. and Canada are trying to piece together a shadowy puzzle that could be an international terror ring preparing to strike America, reports CBS News Correspondent Vince Gonzales. 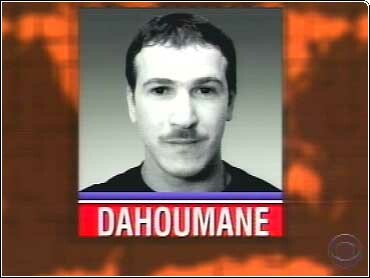 Just hours after raiding an apartment in Montreal, Canadian police Friday issued an arrest warrant for Abdelmajed Dahoumane. The 32-year-old is charged with possession of explosives, though none were found in the search. Sources tell CBS News Dahoumane is believed to have spent three weeks in a Vancouver motel with Ahmed Ressam, just before the Algerian was captured while allegedly attempting to smuggle bomb-making materials into the U.S. at Port Angeles, Washington. Ressam pleaded innocent in Seattle on Wednesday to charges of transporting explosives, making false statements and smuggling. U.S. officials familiar with progress of the investigation said authorities are trying to determine whether Ressam is part of a terrorist organization; speculation has centered on the network headed by reputed terrorism mastermind Osama bin Laden. Bin Laden, a Saudi exile, has lived in Afghanistan, and the officials said Canadian authorities believed Ressam received training there in the early 1990s before moving to Canada in 1994. Meanwhile, across the country in Vermont, officials continue to search for links between the Canadian woman and Algerian man arrested after crossing into the U.S. with false papers. Their car and cell phone were registered to Brahin Mahdi, a Montreal man with suspected ties to an Algerian extremist organization, the Islamic Salvation Front. But Mahdi claims he was only helping out a friend with bad credit: "I'm not a terrorist, believe me. I'm not a terrorist." The alleged founder of that extremist group, Mourad Dhina, a scientist, also denies charges of terrorism. "I totally reject all these charges," he says, "and I challenge anyone to come up with proof." The Washington state and Vermont arrests followed the recent detention of 14 individuals in Jordan who were suspected of planning terrorist attacks on tourist sites and U.S. targets in the kingdom. The 14 are believed to have ties to bin Laden, who is alleged by U.S. officials to have masterminded the bombing of two U.S. embassies in Africa last year. U.S. authorities say bin Laden is communicating with his supporters and has issued calls for terrorists to strike Americans during the holidays. Worried U.S. officials have stepped up surveillance at all border crossings, including those from Mexico. Customs agents have been added and inspections are more intense. "The worries are that we may miss something," says Van Brown of the U.S. Customs Service. "We may miss something and it may affect public safety." Terrorism expert Brian Jenkins worries about the same thing: "I think the authorities are doing all that they possibility can. We have to be realistic, there is no 100 percent securiy. It is not possible to prevent every possible terrorist attack." Officials say they know of no specific terrorist targets in the U.S., but with big millennium celebrations just a week away, they have to do all they can.